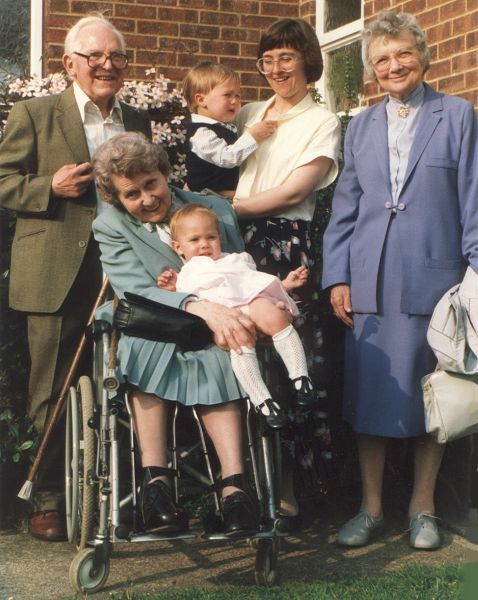 Eric was born in 1916 to Phillip and May Wiltshire. After leaving school in 1936, he trained as a teacher at Borough Road College, Ealing. On 11th November 1940, he joined the Royal Navy for National Service, initially as an Ordinary Seaman, then as a Writer and finally, in 1944, as a "Schoolmaster R.N.". He returned to teaching in civilian life, specialising in Mathematics initially in Ealing, then in Norfolk until his retirement. 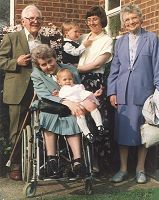 Eric & Sylvia on their wedding day, 23rd August 1943. . Eric & Sylvia with their niece Penny and her children in 1987.